It's most likely that the only problem you've ever had from your AK pattern rifle is keeping it fed. 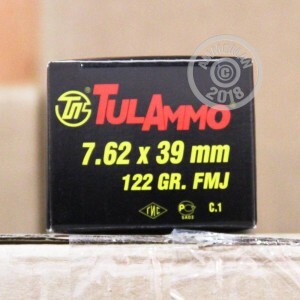 This affordable 100 round pack of TulAmmo 7.62x39mm is great for plinking, practice, and rainy day storage. 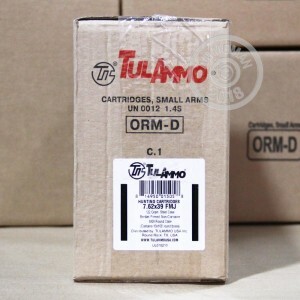 TulAmmo is produced by Tula Cartridge Works, the most prominent ammunition manufacturer and exporter in Russia. They utilize over 125 years of experience in order to produce quality with the utmost efficiency so that they can pass savings on to you. The 122 grain bullets match the most common weight of ammo in this caliber so that consistent accuracy is maintained. Each bullet has a Full Metal Jacket made of copper or bi-metal* and exits the muzzle at 2,396 feet per second. While the steel casings are not reloadable, they are significantly cheaper than brass and fitted with non-corrosive Berdan primers. The casings possess a polymer coating that protects from accelerated parts wear so that you can blast away with your mind at ease. *Bi-Metal jackets are usually made from a layer of mild steel and coated by an alloy of copper and zinc. These softer metals will not cause accelerated wear to the bore of your weapon. 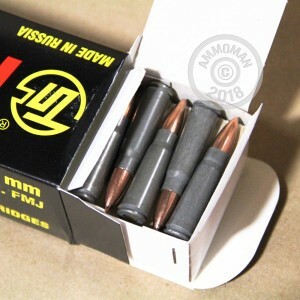 Although they are not designed with any armor-piercing capabilities, some indoor ranges will not allow the use of bi-metal jacketed ammunition. Please check with your local range before use. Good stuff and price was right. I had recently bought the 20 round boxes at my local range for $10 a box, aarrgghh! Got these on sale for $25/100 rounds, you do the math!